You may recall from last year’s post, Helios by the Numbers, that our official project count was really just one of a whole bunch of different numbers. I’m pleased to say that this year we really tightened this up; as a result, I only have two numbers. 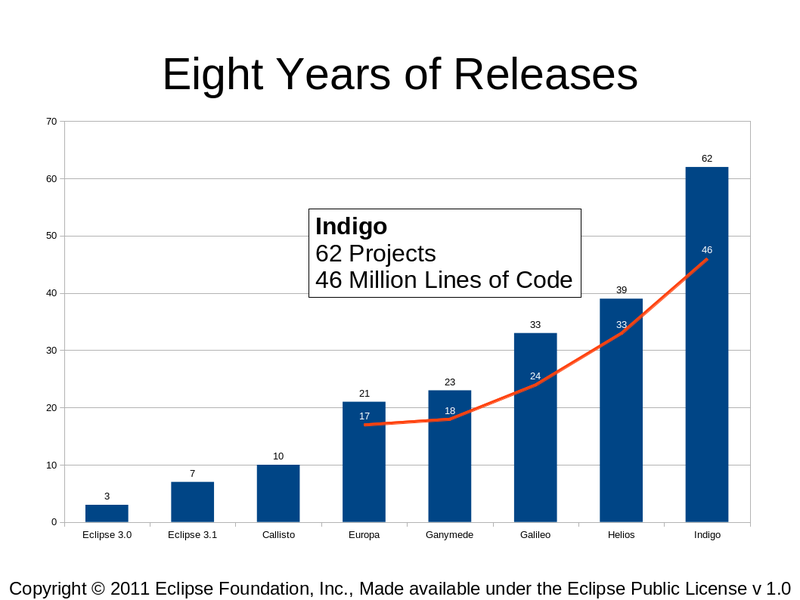 Officially, we have sixty-two (62) projects participating in Eclipse Indigo. This means that 62 projects declared that they would be participating, 62 projects submitted one intellectual property (IP) log each, and 62 projects participated in a release review (including eight graduations from the incubation phase into mature phase projects) for Indigo. Some of those 62 projects were actually “roll ups” of multiple subprojects. This is a feature of how we structure projects at Eclipse: some projects, like the C/C++ Development Tools (CDT) project and ECF, are single projects with single releases, but chose to manage separate functional areas by social convention; other projects, like Eclipse and Web Tools, manage separate functional areas by creating and separately managing subprojects, with a single combined release. We leave it to the projects themselves to decide how they’re going to structure releases. In the case of the Eclipse and Web Tools top-level projects, they choose to make a single combined release that contains the output of several of their subprojects. That single entry for “Web Tools” in the list of Indigo projects actually represents eleven (11) distinct Eclipse projects. If you add up all the subprojects, there’s actually eighty-one participating (81) projects. But, frankly, that number’s really not all that interesting (to me, anyway). Dash reports that more than four hundred (400) committers contributed to Indigo: 408 to be exact. Well, exact is actually hard to determine. 408 distinct committers from the projects participating in the release made at least one commit each into their project’s source code repository between June 24/2010 and June 22/2011 (of course that number could change between now and June 22). Forty-six (46) Million lines of code. Wow.